3 How Does a Motion Sensor Faucet Work? 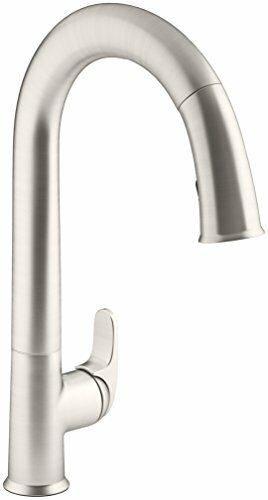 4.2 How Do I Find The Perfect Touchless Kitchen Faucet? Touchless faucets are the must-have fixtures of modern kitchens all over the world. They are easy to use, and they also look great. But did you know that the best touchless kitchen faucet can lower your water consumption? 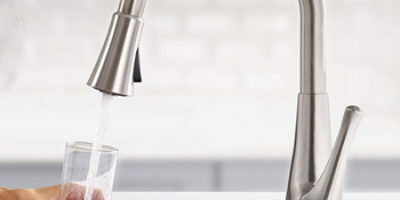 In the following article, we present the touchless kitchen faucet reviews of 2019. We examine each product, and we reveal their pros and cons. If you’re looking for a motion sensor faucet, you’ve come to the right place. Not only do we present the best models currently available on the market, but we also explain how to find the right one for your home. All the touchless kitchen faucets might look similar, but there are significant differences between them. If you want to find the best model for your home, we suggest you read our short buying guide to learn what to look for. 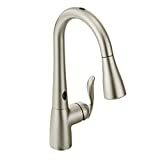 If you’re looking for a high-rated touchless kitchen faucet, there are not many models that can claim they are better than the Moen Arbor. 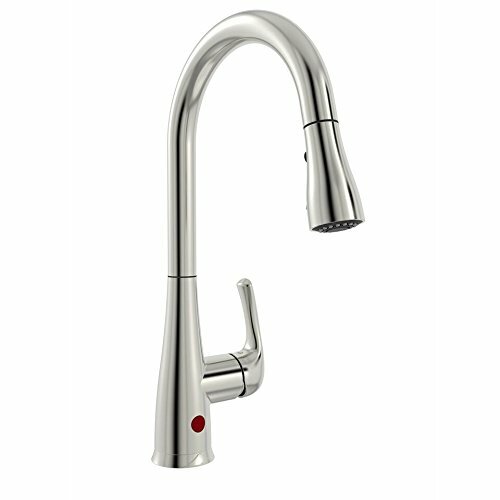 With a high arc pull-down faucet and high-quality finishes, this is one of the most popular models available now. The faucet uses a great motionless feature that will turn on the water when you move your hand in front of the sensors placed on the top and on the base of the faucet. This faucet has a 68-inch hose that provides a great maneuverability, making your everyday chores easier. The hose always returns to its place without guidance, docking smoothly. Two Spray Patterns – The pull-down wand provides not one, but two spray patterns. One of the patterns is better suited for everyday tasks, while the second one is more powerful and it’s better for cleaning pots and dishes. Spot-Resist Finish – The spot-resist finish really makes a difference. You won’t be able to see all the water spots on its surface, and it’s easier to clean and maintain. Sensitive Sensors – Some people might consider the sensors too sensitive. When they detect movement in front of them, they will automatically turn on, even if you don’t want them to. When you’re looking for an elegant touchless pull-down faucet, you should always take into account the faucet’s power consumption. You don’t want to replace the batteries every few weeks. With a power consumption that will only use 4 AA batteries after a year or two, the touchless faucet developed by BOHARERS will make a great addition to most modern kitchens. The faucet provides two different streams of water, and both can be activated by a motion sensor. The faucet’s motion sensor is placed at its base, so the water will turn on every time you move your hand in front of it. The sensor detects movement, and it will automatically turn off once it doesn’t notice any activity for three minutes. Lifetime Guarantee – This faucet is backed by a lifetime guarantee. The manufacturer will change the faulty product for a new one, as long as you’re not responsible for the defect and it’s a factory one. Easy Installation – The faucet comes with a plate that allows it to be installed on single-holed sinks or on 3-holed ones, making it easy to install. Check out top rated kitchen sinks here! Tall – This is a tall faucet and it might splash the water if you use it in shallow sinks. We all know that a faucet doesn’t only need to look good, it has to be very effective as well. When you’re looking for a touchless kitchen faucet, there are more things that matter besides its appearance. Thankfully, the Belanger touchless kitchen faucet provides a good solution to all your problems. 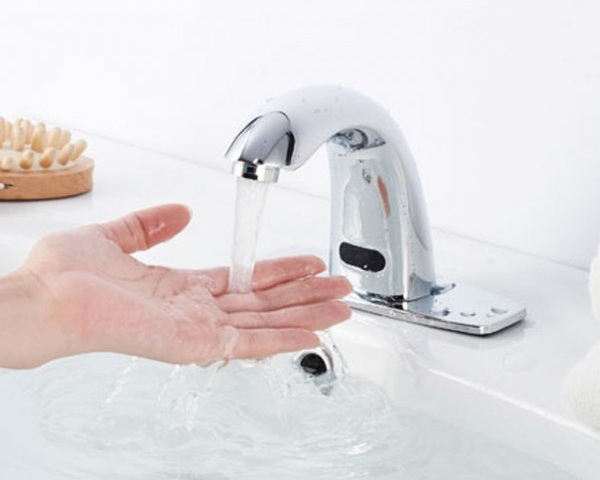 This faucet can be activated by an infrared sensor that tracks your hand movement. The sensor is placed at the base of the faucet, and it will turn off the water if it doesn’t detect movement for three minutes. When you remove the pull-down wand, the water spray will start automatically. Holding the switch on the top of the wand will change the spray pattern produced. High Arc – This faucet has a high arc. The height of the arc will allow you to clean tall pots and long trays without any problems and without spillage. Manual Docking – Unlike other pull-down faucets, this model relies on a manual docking of the pull-down wand. This can be tiresome for many people. If you’re planning on renovating your kitchen, or if you’re building a new one, you have to think about getting the best fixtures and accessories available. Not only will these look good and perform well, but they will also last longer. When it comes to touchless pull-down faucets, the one produced by MiKitchen is a great model. With an accurate motion sensor and an easy installation, this model will make a great addition to most kitchens. The water turns on automatically when you pull down the wand, and it turns off when you release the wand and it goes back to the docking station. The sensor can also be turned off if you want to. Quick Installation – This faucet is very easy to install, and most people will be able to install it themselves, without the help of a professional. Elegant – With a high arc and smooth lines, this model will bring a touch of elegance to your kitchen. Not For Lefties – This is a great product, but it’s not designed for left-handed people. If you’re left-handed, you should look for a different model. When you’re looking for a touchless faucet that combines elegance and functionality, you have to take a closer look at the faucet produced by KOHLER. This model looks great, and it works even better. With a simple, yet sophisticated design, this model will fit perfectly in most modern kitchens, and it will quickly become the centerpiece of the kitchen. The faucet uses a magnetic docking feature that will automatically guide the pull-down wand in the sprout and secure it in place. The spray head is very easy to remove from the spout and it fits comfortably in your hand. Very Good Sensor – The motion detection sensor is very good, and it tracks movement every 20 milliseconds. When the sensor doesn’t track any movement, it will turn off the water flow. Resistant To Buildup – The spray face is resistant to buildup, so you should enjoy using this faucet for a very long time with minimal maintenance, no matter how hard your water is. Solenoid Malfunctions – Many customers complained that their solenoid malfunctioned. This is a vital component of the touchless feature, so it is very important for the faucet as a whole. There are a few manufacturers that can compare themselves with Delta. Delta products are top-notch, and they use the latest technologies to give them an edge over their competition. 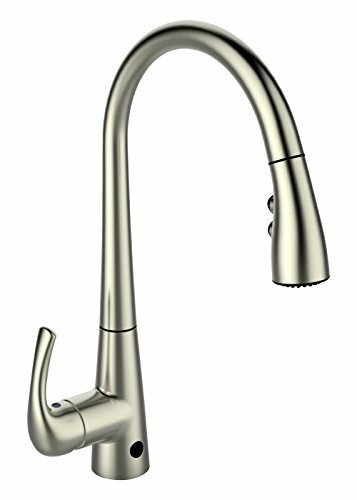 The Delta Essa touchless faucet makes no exception. This faucet comes in 4 different finishes, so you can match it with your other fixtures and appliances. The faucet also uses another system to turn on and off than other models you’ll find on the market. Instead of a motion-tracking sensor, this model can be turned on by a simple touch. When you want to turn it off, you just touch it again. A color indicator will show the water temperature, and you can adjust it easily. The faucet can also be operated manually. Low Battery Indicator – A LED light will notify you when it’s time to change the batteries, so you can always have a functional faucet. Long Lasting Batteries – This faucet uses 6 AA batteries at a time. However, a set of batteries will last for as long as two whole years. Not Really Touchless – Since you have to touch the faucet to start it, and again to stop it, this faucet is not really touchless. However, you can touch it with every part of your hand and arm, so it’s easy to use. A touchless kitchen faucet is a faucet that can be turned on and off without having to operate a handle. These faucets are usually pull-down models, so you can use them with great results for cleaning larger dishes such as pots, trays, pans, and the likes. One of the advantages of using a touchless kitchen faucet is that you can simply take the dirty dish and start cleaning it without soiling the faucet itself. This will keep the faucet looking clean for a longer time, and it’s also easier for you since you can use both of your hands to clean the dishes. Most of these faucets use a motion tracking sensor to turn the water on and off. Some of them use a tactile sensor, and you have to touch them to start the water. You should know that every faucet manufacturer has a registered design that’s used for their touchless faucets. However, the basic working principle stays the same. Here’s how a touchless faucet works. A diaphragm valve operated by a solenoid starts and stops the water flow. A sensor detects the presence of an object in front of it and orders the solenoid to start the water flow. When the sensor doesn’t notice the object any longer, it will order the solenoid to stop the water flow after a determined amount of time. Both the sensor and the solenoid use batteries as a power source. Most models use AA batteries, but some use 6 or 9 Volt Lithium ones. Some models can be connected to an AC source. The faucet spout houses fiber optic cables that connect it to the sensor. The spout might also contain the batteries in some models. This is, in short, how a touchless faucet works. When the sensor detects an object in front of it, it notifies the solenoid to start the water. If it doesn’t detect the object any longer, it will stop the water after a certain period of time (usually 3 minutes). The sensor sends its signals through the fiber optic contained by the spout. Both the solenoid and the sensor are powered by batteries, but they can sometimes use other power sources. Finding a good touchless kitchen faucet can be more difficult than you believe. There are a lot of models available, and all of them have different strengths and features. In the following guide, we explain what the main features of a touchless faucet are, and we reveal how they can help you. The first thing you have to make sure before buying a new faucet is if it comes in the finish you want. If you’re just renovating your kitchen and you decide to change the faucet, you have to find one that matches your other fixtures or appliances. If you’re building a new kitchen, you can first choose the faucet’s finish and then select your other fixtures. Spot Resist Finish – Some kitchen faucet models like the Moen Arbor come with a spot-resist finish. This finish resembles the ones you’re used to in color, but it behaves differently. The finish is more resistant to stains, so water spots and fingerprints will be harder to spot on its surface. This is a good feature, especially if you’re one of the people who doesn’t like cleaning up often. Special Finish – If you’re planning on making the faucet the centerpiece of your kitchen, you can select a special finish to help it stand out. Finishes such as matte black and Venetian bronze can be found in models like the Delta Essa. These finishes will make the faucet stand out, and they will impress your guests. This is a very important feature in a touchless faucet because the sensor starts and stops the water. When the faucet has an accurate sensor, it will start the water as soon as you close your hand or a dirty plate to the base or the top of the faucet. The sensor will also turn off the water when it doesn’t notice movement for a determined amount of time. On the other hand, having a touchless faucet that doesn’t have an accurate sensor can be annoying. The water might start when you’re just passing in front of the faucet, and it might not stop automatically when it doesn’t detect movement. All touchless kitchen faucets use batteries to power their sensors. Even though all use them, their battery consumption is often different. Most models will need 4 AA batteries to run, but there are some models that run on 6 AA batteries at a time. When it comes to battery consumption, you should always choose a faucet model that rarely needs a battery change. Some models only need a change once every one or two years, so why should you choose a model that needs one every 3 months? Changing the faucet’s batteries is not difficult, but it can take up some minutes of your time, and people who have to change the batteries often usually don’t like doing it. 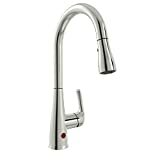 Touchless kitchen faucets are pull-down models. But after you pull out the spray head from the sprout and use it, you have to put it back in. Most kitchen faucet manufacturers implemented features that automatically guide the spray head back into the sprout, but there are still models that use a manual docking. The problem with manual docking is that you have to guide the spray head hose manually back into the sprout. This is often not as easy to do as you would think, and after a few tries most people simply give up on pulling the spray head out. 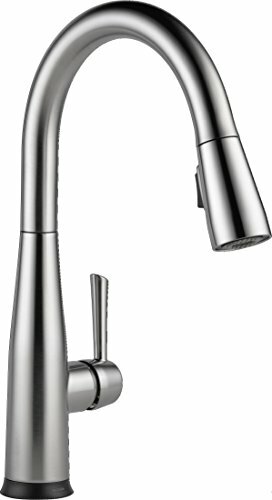 How Do I Find The Perfect Touchless Kitchen Faucet? Finding the best touchless kitchen faucet for your home is often just a matter of preference. Most of these faucets work in the same way, even though some of them are slightly different from the others. If you want to make sure you find the best possible model for your home, think about the following things. You might be wondering why this should be important when you’re buying a touchless kitchen faucet. Well, the simple answer is, children, like to play with things, and they are easily amused. Chances are they will play around the faucet at some point, so they might turn the unit on and off multiple times a day. If you have children, the best thing to do is to buy a faucet model that has a very accurate movement sensor. If the sensor is accurate and it will only start the water if you really get close to it, the kids might not reach it, or they might lose interest in it once they think it won’t work. Another solution is to buy the Delta Essa that has to be touched in order to start and stop. Do You Use A Dishwasher To Clean Your Pots? One of the advantages of having a pull-down faucet is that you can use it to easily clean your pots, trays, and other large dishes. However, some people prefer using the dishwasher to clean these dishes, so the faucet loses one of its tasks. If you usually use the dishwasher to clean your dishes, you shouldn’t look for a faucet that comes with a very long hose because you won’t probably use it very often. Do You Frequently Clean The Kitchen? Now, we won’t hear your answers, so you don’t have to lie to yourself saying you do when you actually don’t. If you’re in the habit of frequently cleaning your kitchen, you can choose every type of finish you like. Some finishes get stained faster than others, but that shouldn’t be a problem for you. On the other hand, you don’t like cleaning your kitchen, and you don’t do it frequently, you should choose a finish that’s resistant to spots. 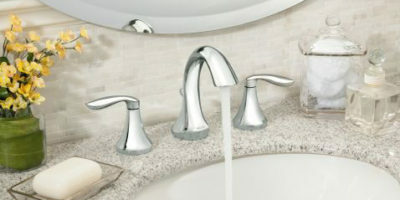 The Moen Arbor comes with a spot-resistant finish that will mask the water spots and fingerprints. This will allow the faucet to look clean for a long time without actually cleaning it. Hands-Free Operation – When you use a touchless kitchen faucet you don’t have to touch anything to make the water start. This can be very helpful when your hands are dirty or when you’re holding something. Controlled Water Flow – The motion sensor detects when objects are in front of it and stops the water when there aren’t any. This eliminates the chances of leaving the water running. Pull-Down Spray Heads – These faucets come with pull-down spray heads that allow you to wash larger dishes with ease. 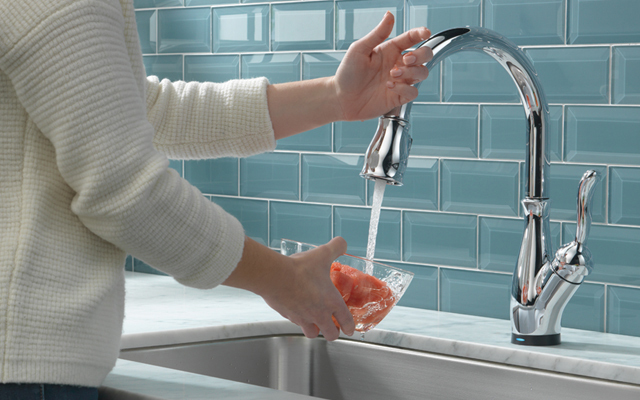 Take the time to weigh the pros and cons of choosing a touchless faucet. 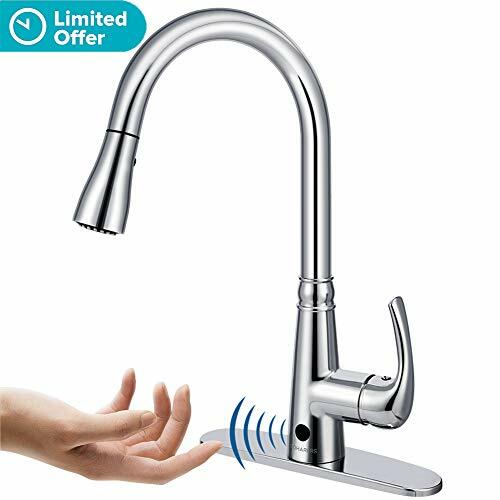 But, if you think it will not meet your water needs, we also have listed the best touch kitchen faucets of 2019! Furthermore, we’ve also rounded up the commercial and fusion style faucets and faucet water filters needed for a serious chef’s kitchen if you’re looking to outfit your kitchen restaurant-grade! Touchless kitchen faucets are considered a particularity nowadays, but they will be a common fixture in most homes in the years to come. Whether you’re building a new bathroom or you’re renovating your old one, installing a motion sensor faucet will be an advantage. These faucets are more efficient than regular ones because they allow you to use both hands at all times. You don’t have to turn it on, it can do that all by itself. Touchless faucets also come with pull-down spray heads, so they are very efficient at cleaning larger dishes such as pots, pans, and trays. We’re convinced that after reading our touchless kitchen faucet reviews you are able to determine which is the best model for your home. Keep in mind that finding the best touchless kitchen faucet isn’t about buying the most expensive model, it’s about finding one that has features that can help.